Doublo lifting that provides powerful lifting deep inside skin without surgery, instant under eye wrinkles improvement and lifting effect by reaching SMAS layer, the cause of dermis, under eye winkles, and skin drooping and under eye treatment. Moist and clear with water light! 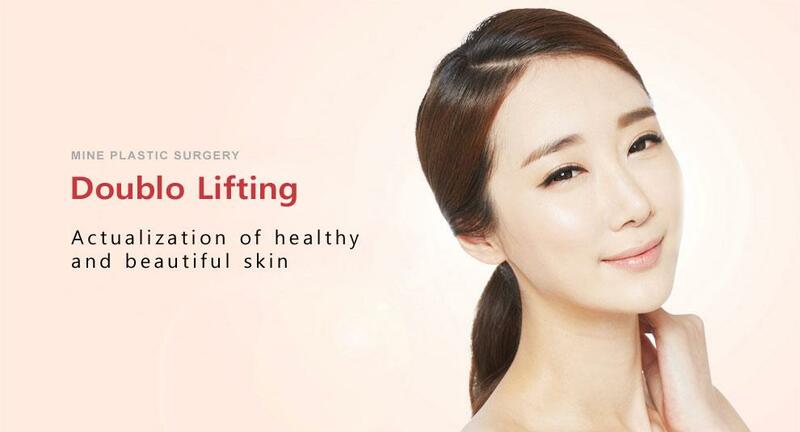 Doublo lifting elasticity strengthening lifting effect! As skin pulling is achieved by transferring heat to 3~ 4.5mm depth muscle fascia under skin surface, this equipment provides lifting without making incision. Water light injection fills up skin supplementary material composed of hyaluronic acid constituent inside skin, and helps supplement moisture and maintain with moisture coat created inside skin. While improving skin elasticity and winkle simultaneously, smooth and sparkling effect such as shining skin can be expected. Action II Fractional laser carves protruding skin with 2940nm wavelength layer, makes border smooth, and scar portion is raised by increasing collagen generation for groove area.